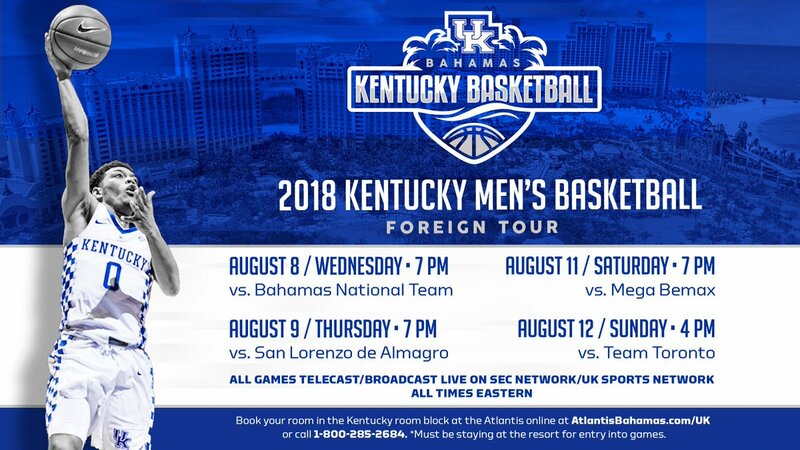 We’re a little less than one month away from Kentucky basketball’s four-game trip to the Bahamas and the program released a little more info about the games today. Aug. 8 vs. Bahamas National Team – 7 p.m.
Aug. 9 vs. San Lorenzo de Almagro – 7 p.m.
Aug. 11 vs. Mega Bemax – 7 p.m.
Aug. 12 vs. Team Toronto – 4 p.m.
All four games will be televised on the SEC Network with a broadcast crew of Tom Hart on play-by-play and Seth Greenberg and Dan Dakich providing analysis. Additionally, Tom Leach and Mike Pratt will produce the usual statewide radio broadcast on WLAP and its affiliates or on UKAthletics.com. If you’re still interested in making the trip — maybe the thought of Dan Dakich in swimwear caught your interest — you can still book accommodations by visiting AtlantisBahamas.com/UK. Remember, you must stay at the Atlantis to attend the games. Tickets can only be purchased if you have a room reservation. I really wish the games were earlier. Maybe more like 4 or 5, not at night. Why would anyone want an afternoon weekday start time? If the goal is to get people to watch the SEC Network, that certainly wouldn’t do it. So Uk is excepting me to spend all that money to go to Bahahas and stay in a resort filled with SIN,,, just to watch them play that level of oppnoent ??? i dont think so MITCH ,,,this is just another money grab by this greedy administration while crapping on the REGULAR fans !!!! They don’t expect anything from you, or anyone else. Those that can afford to do it, will do it. Just curious what SIN you are talking about? Cause if it’s the casino thing, which is all I can figure you’re talking about, you do realize the guy in your username owned and still has stake in casinos right? Sin? For real? And with that username?! The irony is too much. Me to, honestly idk why I’m so hyped for this year’s team compared to most but I truly am. We do have a solid, deep, strong team, with some veterans and some shooters. Understatement of the year for me, I feel like this will be the year we hang #9.